Long, lean, lithe and flexible. Sigh. How come I didn't look like that when I was doing rhythmic? Err ok never mind. Everytime there is an opportunity to have lunch outside campus, everyone at work leaps for joy. Suddenly the possibilities of lunch expand, and glorious visions of non-canteen food are enough to make one's day. Something to eat besides chicken rice, yong tao foo and bad Chinese food? Glory be. Today was no difference, and the lunch OUTSIDE university was generally looked on with great anticipation and pleasure. The occasion was a farewell lunch for a colleague who is leaving us, the same person who so very lovingly termed canteen food "dog food". But then again, that is coming from someone who brings his own lunchbox to school, with accompanying placemat and metal cutlery. Also the same person who brings his own "high-grade" teabags to Chinese restaurants. We went to Jurong Country Club for lunch, and ordered Taiwanese porridge with lots and lots of dishes. Dishes you can't get in school. Like cai por, and fatty pork, and dim sum. Yumyum. Sadly, lunch was over too soon, and we returned sated back to the office. I'm going to miss SP, with his quirky habits and little treats of hotel-bought pastries ("at half price", he proudly announces) and his amusing emails. Life at work is going to be dull without someone to larf at and with. Last night for the first time I can remember in a very long time, my mother apologised for getting mad at me. I had gone back to my room, silently fuming and very sore about the scolding (which I have to admit was slightly warranted), when five minutes later, she knocked on my open door. She stepped in, twisting her T-shirt in front of her sheepishly and saying, "I've come to apologise. I shouldn't have spoken to you in that way." She then went on to explain that she had been unfair for jumping down my throat in that way, and then further gave me much more credit than I deserved in my actions to her. Her apology left me very much softened and gave me a huge desire to burst into tears. I am dumbfounded and don't know what to think. I caught the PM's rally speech on Sunday night, and in between drifting off (and falling asleep) during his loooong speech, this one announcement made me sit up and cheer. A 5 day work week for civil servants! Whoo-hoo! This morning, everyone received an email from the Vice-Dean asking for our inputs on a 5 day work week. Should we do a Mon-Fri 5 day week for everyone, or should we do a rotational 5 day week, with different days off for different staff every other week? Aiyah, just do a 5 day week lah. Phoo to efficiency and productivity, I say! heehee. I wonder if this is immediately effective. It's my turn to work on Sat this week. 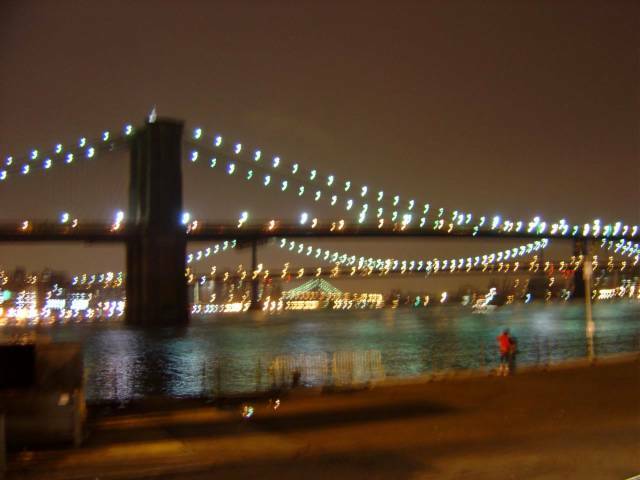 Brooklyn Bridge and some other bridge I can't remember the name of. View of the city from on top of Empire State Building. Pretty lights! 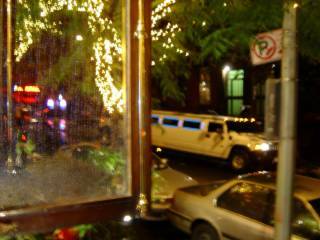 A Hummer limo that was parked outside Cafe Lalo for a bit. 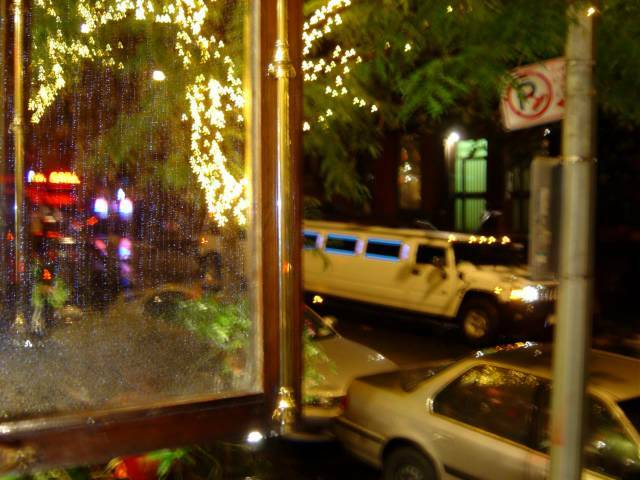 I didn't know Hummers came in limo form! On another note, have figured out how to post pictures here. Whee! Well ok, maybe I can write a little now. 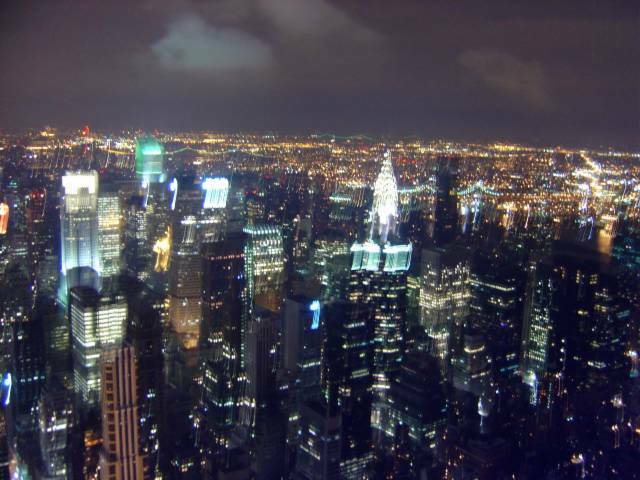 New York is stunning, and glitzy and pretty much everything I imagined it to be. I had to keep reminding myself that I was IN NEW YORK, even while walking in Times Square. The lights! The action! What do I look at? And oooh, isn't that Sephora? We walked pretty much everywhere, and where we couldn't walk, we subwayed it. One of my proudest moments was when I took the subway ALL BY MYSELF to Broadway and didn't get lost at all. I'll be New Yorker yet, haw haw. The week was a whirlwind of shopping, walking, eating, doing the gawky touristy things, more shopping and not much sleeping. And also lots of catching up with my friend, who's now studying in Columbia. One thing I'm slightly sore about is that I didn't get to try the Soup Nazi soup. Apparently he's closed in summer. Probably enjoying the massive profits he makes from the other times of the year. 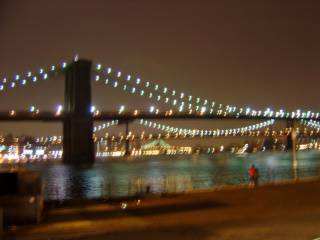 Looks like I'll have to make another trip to NY, but this time in winter. Now I can be one of those smug people who, after reading or watching TV shows/movies set in New York, and when street names are mentioned, or places are mentioned, I can say very knowingly to no one in particular, "I've been there! I know where that is!" Rawk. I'm off to New Orleans and New York tonight for my work trip / hor-leeday! Hurrah! Am looking forward to lots of jazz, Cosmopolitans, going to the Seinfeld diner, drinking soup at the Soup Nazi place, Statue of Liberty and SHOPPING (Hello Gap, Old Navy, Victoria's Secret, Urban Outfitters and discount outlet malls!). Hurrah!